In a hands-on comparison, a Dell EMC-certified engineer installed and configured a new Dell EMC solution faster and more efficiently than an in-house administrator. Durham, NC, February 13, 2018 --(PR.com)-- Adding hardware to a datacenter can boost an organization’s capabilities and offer productivity enhancements that drive competitive advantages. 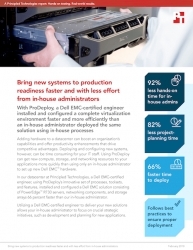 In the Principled Technologies datacenter, a Dell EMC-certified engineer using ProDeploy for Enterprise processes, toolsets, and features installed and configured a Dell EMC solution consisting of PowerEdge R730 servers, networking components, and storage arrays faster than an in-house administrator. To learn more about the time savings and benefits of choosing ProDeploy for Enterprise, read the full report at http://facts.pt/YU95pg.